To celebrate 15 years at South Bank, Ahmet's want to celebrate by giving away the ultimate Turkish Feast for you and 9 friends! Enter your details to be in the running to win! 1.1 Information on how to enter forms part of the terms of entry set out in Clause 3. 2.1 Subject to clause 2.2, entry is open to all residents of Brisbane, Queensland. associated companies are not eligible to enter. August 2018 at 17:00 AEST (the Competition Period). details into the online competition form and submit the completed form (Qualifying Entrant?). clause 3.2, are eligible to win the Major Prize. 3.4 Entrants in the competition may only enter once. 3.5 Entries must be received by Friday 31 August at 09:00 AEST. receive the prize as set out in clause 4.2 below. Prize Winner and their guests will not be entitled to any fee for such use. photographs to any media or other organisation. nominated parent or guardian as determined by the Promoter in consultation with the Prize Winner. 4.6 Subject to clause 4.5, prizes cannot be transferred. required in clause 3 (Qualifying Entrant) will be entered into the Major Prize draw. become the Major Prize Winner. 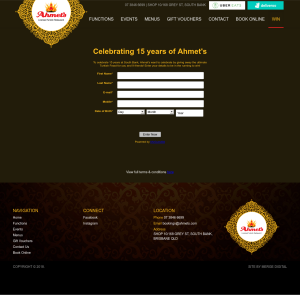 announced on the Ahmet's Licensed Turkish Restaurant website: www.ahmets.com.au. the prize and all prize supplier's requirements. will take no responsibility for prizes damaged or lost in transit, or late, lost or misdirected mail. 7.1 Ahmet’s Licensed Turkish Restaurant promotes and practices the responsible consumption of liquor. Turkish Restaurant, of 10/168 Grey St, South Brisbane QLD 4101. Prospect Street, Fortitude Valley QLD 4000.
with carefully selected business partners for the purpose of them sending you such information directly. We will always provide you with the ability to opt out of those communications.